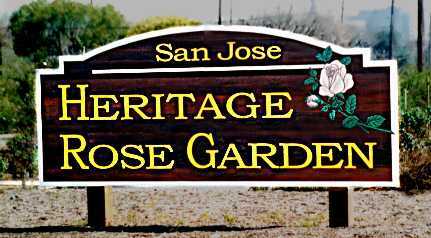 The San Jose Heritage Rose Garden is an unexpected jewel in the midst of a revitalized downtown San Jose, California; a five-acre rose garden that contains 4,000 plants. How did this happen? In 1987 San Jose Mayor McEnery initiated turning land cleared for airport safety, a weed infested eyesore, into a central park for San Jose. In 1988, Tom Liggett was approached by Lorrie Freeman, "The Mother of Guadalupe Gardens" and avid rosarian, to develop a competitive proposal for a rose garden in the area. His concept grew from an initial half-acre plot to a full city block. In 1992, Tom's proposal for a San Jose Heritage Rose Garden was selected and funded by the San Jose City Council. Local Councilmember David Pandori steered the garden safely through the political shoals. The Garden is in the shape of a large bowl, the center of which is 5 feet deep. This allows the observer to see every single plant from every place in the garden. Inside the garden are six large diamond- shaped sections, each containing a basic class of roses. * First, our garden was planted and is maintained almost entirely with volunteer labor. * Second, we use no chemical sprays. those we feel will be rare in the future. important to the history of rose hybridizing. "Unknown" or "found" roses are an important component of a heritage rose garden. These are varieties found in old cemeteries, around old homes, or along country byways. Pending identification, these roses are given study names listed in quotes that usually indicate where that variety was found. Growing our own plants is the key that makes the garden work. We collect budwood and cuttings from all over the United States and Europe. Ed Wilkinson spearheaded the European collection, especially. Many individuals and nurseries are very generous in giving us their varieties. In March 1995, the garden was planted after five years of procuring and growing plants in a field over 40 miles away. Over 750 volunteers showed up over 3 weekends in spite of record rains! Since that time, we continue to collect and grow additional varieties. We average 3 major plantings a year. It was dedicated by city officials in September 1995. Tom designed the garden to be a "rose encyclopedia." In the course of a spring afternoon, an absolute beginner can stroll through our garden and acquire more real knowledge about the rose family than in weeks of reading books. That's the whole idea. It continues to inspire dedicated volunteers. We believe our garden now contains more varieties than any other public rose garden in the western hemisphere ... a rose garden all San Jose can be proud of. But what is more important is that through all of the problems, the garden was planted. And is growing. And is beautiful. Noted rosarian, Robert B. Martin, Jr., described it as the "holy place that all rosarians should visit sometime in their lifetime." 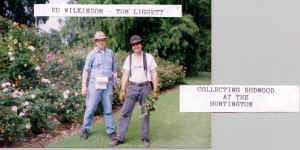 Initiation in 1997 of annual free public pruning lessons during January and early February. This has helped get the Heritage pruned and has made a visible improvement in roses in the area’s front yards! April 1997. Origination of the Friends of the Guadalupe River Park & Gardens (FGRPG) annual festival, Spring in Guadalupe Gardens, coordinated with the Heritage’s peak spring bloom the last Saturday in April. This carries on an on-and-off San José tradition of rose-oriented festivals starting in 1895. Hiring of staff in 1997 by FGRPG to recruit and support volunteers. Afterworkday snack times started on Wednesdays. 1997. Addition of a dedicated toolshed for convenience to volunteers. 1997. A continuing program of replacing duplicate roses and those out of their proper place with the correct roses for their locations. This has increased the number of varieties by over 1200. 1997. Removal of three feet of soil from the front and back berms to permit viewing of the Heritage from Taylor Street. 1999. Addition of a plot in the adjacent Courtyard Garden to place miniature roses released after 1988. 1999.Conclusion of an arrangement with the Santa Clara University to plant up to 260 climbing roses on their ½ mile wrote iron fence. 240 are already in place and growing. 2000. Finally, completion of winter pruning of the whole garden in one year (except climbing roses). 2001. Replacement by volunteers of the entire drip irrigation system completed. 2002. Addition of a program to progress through all climbing roses, pruning and tying them to tree pole uprights. 2002. The very successful American Rose Society Spring Convention, held in San Jose with the Heritage as the feature attraction in 2002, the Year of the Rose. 500 attended from across the US and around the world. 2001 & 2002. Five articles describing the garden were published in four international rose magazines. 2003. Major increase in the progress of getting all the roses in their proper places identified with identifying plaques. The only restriction on completion is their approximate $10 each material cost. 2004. After over 2 years of planning and receiving donations, The Heritage has its own nursery. We have a place and facilities to support growing out over 300 roses to a size where they can compete in the main garden. Material was funded by donations and major reductions in price. Labor was provided by the San Jose Conservation Corps. 2005. Guadalupe Gardens Phase I completed including a handy parking lot and conversion of the entire garden to recycled water. Lovely new directional and interpretive signage has been added to the complete park. These years have seen the Heritage emerge from an obscure garden in a seldom visited area of San Jose to a world renowned destination for rose lovers across the nation and around the world! This page has now been translated into Belorussian by Martha Ruszkowski! You can see it here: Belorussian translation. It has also been translated into Polish by Andrey Fomin! You can see it here: Polish translation. This page was last updated on 04/12/11.